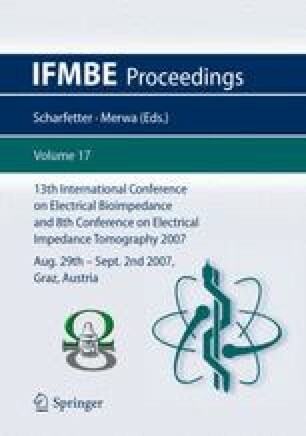 Existing methods of impedance cardiography for estimating blood flow parameters are based on measuring amplitude and temporal characteristics of pulse waves in specific points. Our aim was to improve the algorithm of blood flow analysis using continuous "integral amplitude" of rheogram. Also, we have developed the basic hemodynamics equation for our heterogeneous model taking into account anthropometric, morphologic and anisotropic of various body segments. The resulting formulas were adapted for the estimation of peripheral blood flow in major body segments (head, arms, legs and torso, including abdominal and thoracic region).A method of controlled systemic hemodynamics estimationis represented which utilizies an automatic commutation scheme with application of 5 electrode pairs on head an extremities. We describe the results og registration of blood flow redistributionbetween body segments during active orthostatic test with simultaneous control of a checksum, i.e. a difference between the volumes of central and peripheral blood flows.